Custom AwardsYou Dream It, We Create It!!! Create the most awesome custom awards on the planet. Our goal is to create the perfect award with a “wow” factor. We offer custom awards in either acrylic or crystal, custom 3D crystal awards, custom medals, custom dog tags, custom plaques, and custom award belts. Our LogoCut custom acrylic trophies can be made to fit any budget, any size, and any shape. We design around your company’s logo or message. For more information on expected pricing and design styles click here. 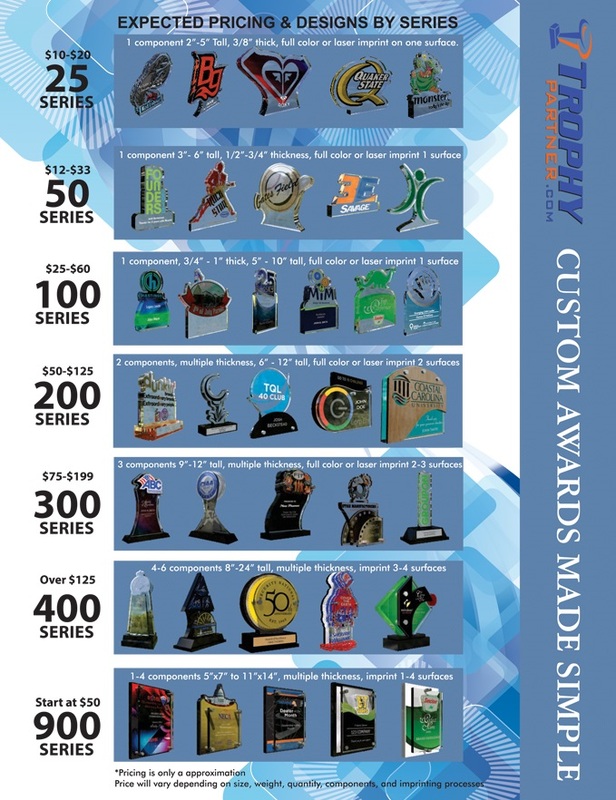 Our Custom Crystal Trophies can be used to recognize sales achievement, years of service, retirement, rising stars, or any award occasion, We offer the largest selection of imprinting processes in the industry including deep etch,colorfill, Illumachrome, and 3D subsurface to make your awards showstoppers. Our 3D Custom Crystal Trophies can be used to incorporate any message, logo, building, or new product inside the crystal. The possibilities are endless. Our Custom Award Belts are taking the industry by storm as they are a truly unique wearable award that the recipient will love to show off. For many years these belts were strictly for wrestlers, but now they can be customnzied with artwork and text to recognize achievement in sales, safety, or the winner of any event or contest. We offer FREE design service on all of our custom awards. With our concierge service we will get on the phone with you to discuss your vision. Provide us with your artwork, logo, and budget range, you then can expect 2-3 customized design options offered within just a few days with no obligation. Our awards are one-of-a-kind, high quality, affordable, and sure to please.